The Emerald Ash Borer has caused major destruction in Illinois by invading millions of Ash trees. 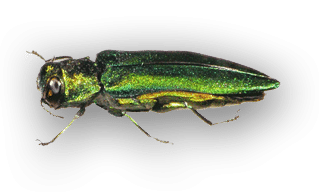 The Ash, a typically resilient tree to the stresses of residential locations, is no match for the Emerald Ash Borer. The insect burrows in the tree right under its bark, effectively destroying its water and nutrient transporting tissues. Eventually, the Ash succumbs to starvation with no way to absorb its food source. Severe environmental and economic consequences are occurring as a result of Ash trees dying off across the Midwest. However, a plan to deal with the stressors of Emerald Ash Borer can mitigate the negative effects felt by a community. For more information, see the State’s PDF press release. Help us inventory the city’s population of ash trees by reporting trees on your property. Email the team rockfalls.eab@gmail.com.